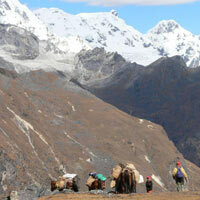 The Jomolhari trek offers a taste of the great variety of Bhutanese landscapes. Starting Drugyel Dzong, we pass through scattered hamlets and farmland, into a deep and richly forested valley, which leads to a high alpine pastureland where yak herders graze their animals. You can have the view of Mt. Jomolhari from the second camp and as you near the campsite you will be greeted by Mt. Jechudrakey and Mt, Tsherimgang. First three days you will hike gradually uphill following the stream which originate from the Mount Jomolhari, and two days of crossing high passes Nyilila Alt. 4650 M. and Yali-la Alt. 4950 M., and again three days of descending to lower region following the Thimphu river to Thimphu valley. Our highest camp, at base camp Alt. 4100 M. of Mt. Jomolhari, is in magnificent location with view of Mount Jomolhari.Tour cost mentioned do not include Air fare. Personal Expenses : Telephone calls, Alcohol. During the flight, you will experience breathtaking views of Mount Everest, Kanchenjunga and other Himalayan Peaks like the sacred Jhumolhari & Jichu Drake in Bhutan. On arrival you will be met by your guide and transferred to your hotel. After breakfast, drive to Drugyel dzong, the ruined fortress which once defended Paro valley from Tibetan invasion. This fortress, now a burnt shell, was strategic in Bhutan's defence against Tibetan invasion. 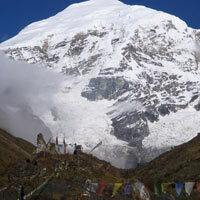 The sacred mountain Jhumolhari (7,314 meters) can be seen in the background on a clear day. On the way back we visit the National Museum. After lunch a half-day excursion to the famous Taktsang monastery (Tiger's Den) to the viewpoint. Overnight Hotel. After breakfast, drive up to Drugyel dzong where the road ends and the Trek begins. Following the Pa Chu River gently uphill through a narrowing valley. Camp is just beyond an Army Post. Altitude: 2800 meters. Distance: 17 km. 5-6 hrs. Continue uphill through the River Valley. It narrows and closes in and the trial winds up and down along the waterway. Camp is in a meadow with a stone shelter built for trekkers. Altitude: 3600 meters. Distance: 21 km. - 7-8 hrs. On up the Pa Chu River, passing a small Army post where the valley widens again. One can view the high ridges and then the snow-capped peaks located all around. You begin to see Yaks and the Yak Herders' Camp. Altitude: 4040 m. Distance: 19 km. - 5-6 hrs. 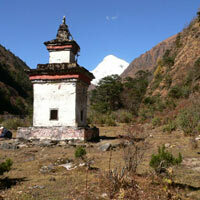 Trek up to Tsophu or there are stupendous day-hikes in three directions. Jhumolhari and its subsidiary are directly west. Jichu Drake to the north, unclimbed summits and ridges to the east. Wide Yak pastures on the way up and down the pass, possibly see some people in their Yak Hair Tents depending on the time of the year you are there. Great view of Lingshi dzong as you come down into the Lingshi basin if the weather is clear. 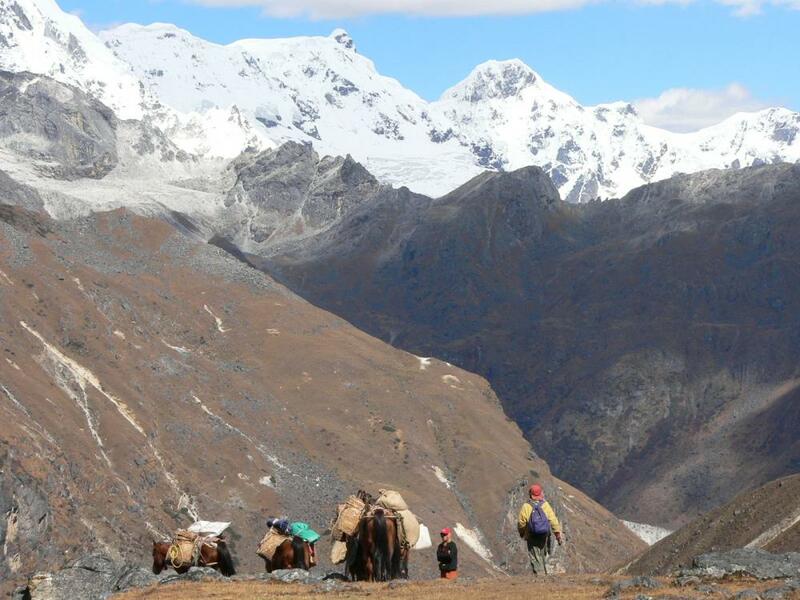 Tserim Gang and its descending glaciers at the north end of the valley. Camp is in a stone shelter built for trekkers. It has an inside fire pit and you can sleep on a wooden floor or in a tent. Altitude: 4150 m. Distance: 19 km. 5-6 hrs. A day excursion to Tshokha (lake) i.e. base camp for Jichu Drake. During the excursion it is possible to see hundreds of Blue Sheep and Musk Deer. Altitude: 4500 m. Distance: 15 km. - 3-4 hrs. The trail ascends up to the Yalila Pass (4820 m.) from the Mount Jhumolhari. 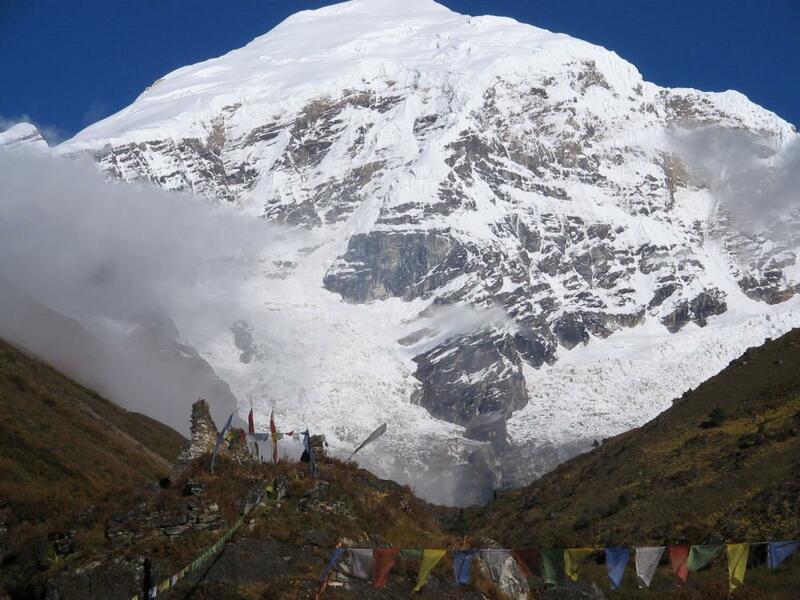 On a clear day, Tserim Kang and Masagang can be seen. Camp is in a stone shelter. Altitude: 3963 m. Distance: 22 km. - 7-8 hrs. Follow the Thimphu Chu River through the thick forest of Rhododendrons and water falls. It narrows and closes in and the trail winds up and down along the waterway. 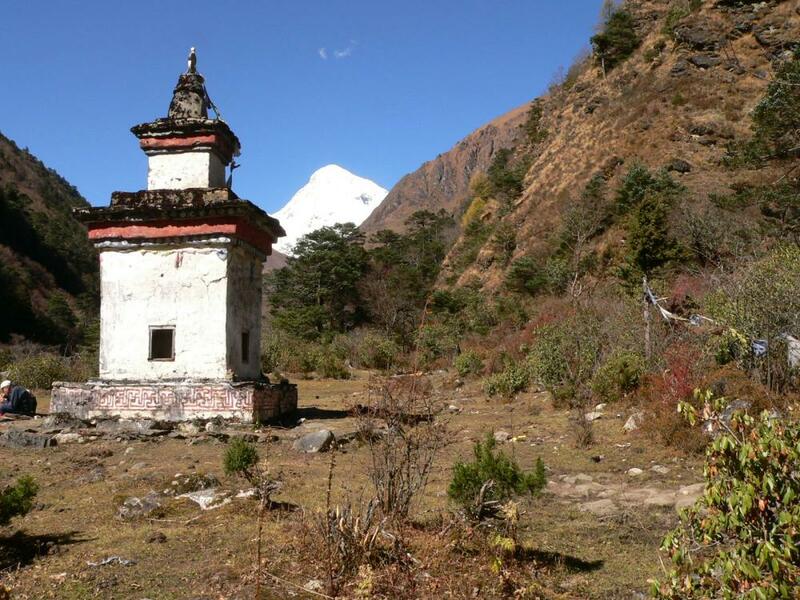 Ascending up to the ruins of Barshong dzong, camp is just below the ruined dzong with a stone shelter. Altitude: 3785 m. Distance: 13 km. - 3-4 hrs. Descending down to meet Thimphu River following gradually through the forest of rhododendrons and ascending up to the pastureland. Camp in a meadow. Altitude: 3628 m. Distance: 11 km. - 3-4 hrs. Continue up hill to a small pass. The trail winds up and down along the waterway. Wild animals, such as the Languor, can be seen. At Dodina, meet the transportation van to return to Thimpu and a comfortable hotel. Distance: 4-5 hrs. Overnight Hotel. A full day sightseeing and shopping in Thimphu. Wander in the town, visit the Handicraft Development Center. Afternoon visit Memorial Chorten, Zilukha Nunnery. Overnight Hotel. Full day excursion to Punakha/Wangdue (1250 m.) valley across Dochula Pass. On a clear day a whole range of the northern snow capped Himalayan Peaks can be seen from the pass. Overnight Hotel. Tour cost mentioned do not include Air fare. Copyright © 2012 Bhutan Druk Adventure. All Rights Reserved.